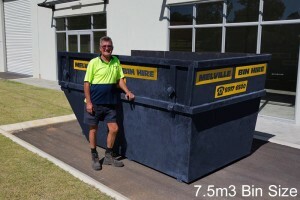 How do I know which skip bin size I need? We are often asked ‘What size bin should I get” the best way to estimate it is by using the rough guide of images below. Estimating is not easy and we have created this little guide to help you decide. We often find more to off load than originally thought when we start a clean-up of any sort, the extra space in a bigger bin can always get used. The money you can save by going to the next size bin is less than an additional $100. But if you have to order another bin the smallest can be an additional $300 plus. Skip bin sizes are always expressed in cubic metres. The table below shows approximate equivalences of cubic metres to the well-known sizes of a box trailer and a wheelie bin. You are normally going to be disposing of cabinetry, old shower screen, curtain rail, tiles, toilet and possibly a bath and the packaging that your new materials were shipped in. We recommend a 4 cubic metre skip bin for small bathroom renovations. 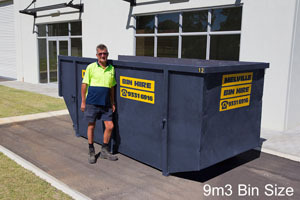 We recommend a 4 cubic metre skip bin when moving house and need a ‘small’ clean-up. Kitchens can vary because of the size of kitchens in houses today. The waste generally consists of cabinetry and bench tops, possibly a stove and dishwasher, floor coverings, wall tiles and packaging that your new materials arrived in. We recommend a 4-6 cubic metre skip bin for kitchen renovations. If you are moving house and throwing out furniture or whitegoods, bikes, exercise equipment, as well as general junk items. 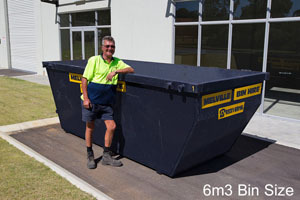 We recommend a 6 to 12.5 cubic metre skip when moving house and need a ‘large’ clean-up. Depending of the scale of your job of course, usually this is enough for a small paving job, or a garden renovation where lawn etc is being removed. There is often more waste left over on these types of jobs so a little bigger is always best. We recommend a 7.5 to a 9 cubic metre skip bin when building or renovating. We recommend a 6 -7.5 cubic metre skip bin with a general garden clean up. This always depends on the garden size of course, for more information call us to get more help.. This is for your larger renovation, a major garden over haul and new building and or extensions. More commonly there is a lot of foundation work and items to be removed before you can even start. The remaining use is for cut off’s etc for new work going in. Some times we have the unfortunate job of clearing out a loved ones smaller home or unit. This would be ideal suited for this type of job for the unwanted items. 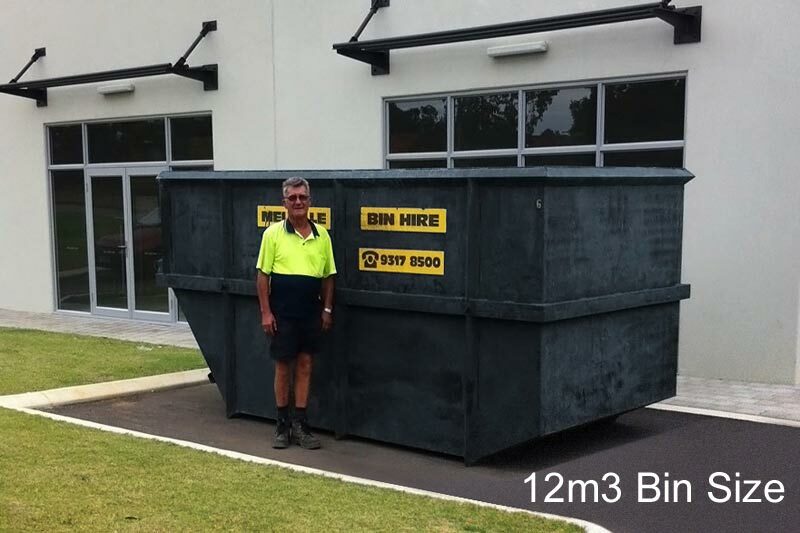 We recommend a 9 or a 12.5 cubic metre skip bin when building a new house extension or cleaning up a deceased estate. If you are clearing out a house completely, you will often require at least a 12.5 cubic metres to remove all the material. Especially if you are relocating a loved one and they have lived in the house for a very long time. Often 2 bins, first bin delivered and then a second possibly smaller one swapped over once the first one is full. We recommend a 12.5 cubic metre skip bin when cleaning up a larger deceased estate. It is relatively easy to estimate the quantity. A general rule of thumb how to work out the volume of area to be removed is by multiplying length * width * depth and then multiply again by 1.3 to allow for packing inefficiency. Note: These bins ordered are specifically sand/soil bins and no other material is to be included. Excavations are generally not in the shape of a regular rectangle, don’t worry too much about the exact volume, as the packing efficiency is always going to be approximate anyway. 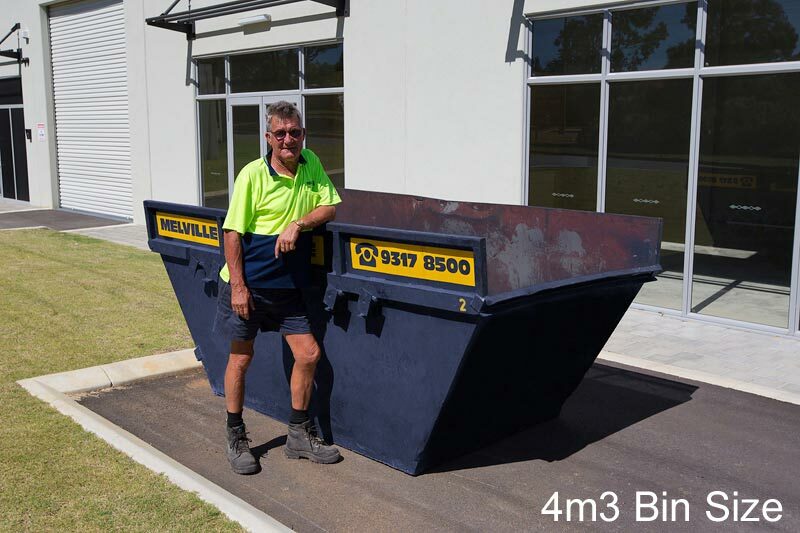 Use your best guess as to the dimensions and choose next bin size up if your close to the cubic measure you were going to hire to be safe. Remember if you are cutting away an area of lawn, you will need to estimate the average depth of cut as well to allow for sand/soil going in the bin with it. 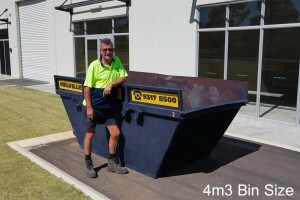 We reccomend a 12.5 cubic metre skip bin when removing lawn or large soil projects. Step 1 – Multiply length * width * depth to get the volume of the area you are demolishing. Step 2 – Multiply again by 1.5 to allow for packing inefficiency. Note: These bins ordered are specifically brick/concrete bins and no other material is to be included.